A new bridge in Greater Manchester has reopened after a £4m scheme by Network Rail to upgrade the old bridge, which runs above the railway.The original century-old Richmond Street bridge in Ashton-under-Lyne had come to the end of its useful life and was in urgent need of replacement. As part of Network Rail’s Railway Upgrade Plan, the project, which started in April this year, replaced the structure with a new bridge which is expected to last for 125 years. 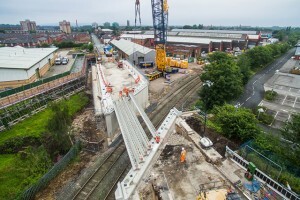 The 730 tonne bridge was installed during the August bank holiday using an 800 tonne crane and will help provide a better, more reliable rail service through Ashton-under-Lyne. It reopened to motorists and pedestrians on Monday, 14 November. Cllr Joyce Bowerman, chair of Ashton Town Council, part of Tameside Council, said: “I’m pleased to see the new bridge in place as part of a £4 million investment in the borough’s infrastructure. “I’m sure near-by residents and businesses will be happy to have Richmond Street open again after so many months. Traffic disruption is always difficult to endure but the original bridge was 100 years old and beyond repair.”The new bridge will require less maintenance, meaning less disruption to passengers and local residents, and will serve the local area for decades to come.